This dialog allows the designer to specify the properties of a Power Port object. A power port is an electrical design primitive. It is a special schematic object used to define a power or ground net. Power ports allow the designer to conveniently indicate a power net at any location in the design, which can then be connected to pins or wires. For information on how a placed power port object can be modified graphically, directly in the workspace, see Graphical Editing. The Power Port dialog can be accessed during placement by pressing the Tab key. Double-clicking on the placed power port object. Placing the cursor over the power port object, right-clicking and choosing Properties from the context menu. Color - click the color sample to change the color of the power port's graphic and associated net text, using the standard Choose Color dialog. Location X/Y - the current X (horizontal) and Y (vertical) coordinates for the connection point of the power port (its electical hotspot). Edit these values to change the position of the power port in the horizontal and/or vertical planes respectively. Orientation - specify the orientation of the power port, counter-clockwise in relation to the horizontal. Options available are: 0 degrees, 90 degrees, 180 degrees, 270 degrees. Net - use this field to specify the name of the power net to which the power port is to connect. 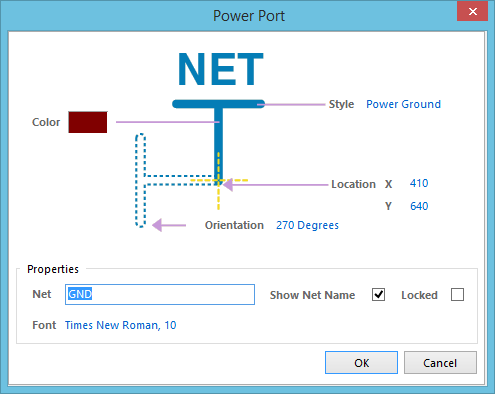 Show Net Name - use this option to control whether the name of the power net associated to the power port is displayed (enabled) or hidden (disabled). Locked - enable this option to protect the power port from being edited graphically. Font - this control serves two purposes. Firstly, it reflects the currently chosen font – applied to the text for the associated net name - in terms of Font Name, Font Size and Font Style. Secondly, when clicked it provides access to the standard Font dialog, from where to change the font as required.